ATTN: This announcement is for all subscribers of TOPC's weekly e-newsletter, LIGHTWEEK. by varied authors, under the GNO project. Welcome to The Online Physics Club! 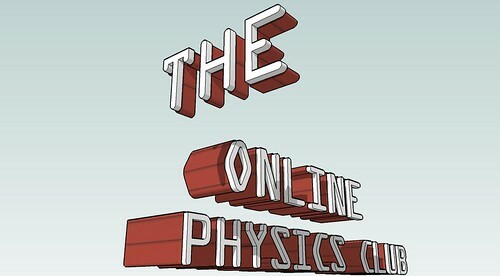 The Online Physics Club is an absolutely free, purely online club entirely dedicated to Physics; from A to Z. Whether you're a Physicist, an aspirant Physicist, or an admirer of Physics, just hop into TOPC and discuss Physics - the truth about the universe! TOPC is the most promising platform on-line, for physics enthusiasts all over the world to come together, share their thoughts, discuss Physics (and Mathematics) submit write-ups, request comments for their articles, and the list is unending. *Spread the knowledge of, and liking towards Physics among all people – all over the world. *Make physics easy to understand by explaining it in the common man's language, so as to prevent its being perceived as complex. *Write articles and publish it to support the above two aims. *Discuss Physics (and Mathematics, where necessary) so as to aid in improving our knowledge of the same. *Question TOPC members, answer questions. Ask for others' opinions and comments, and give your own opinions and comments. *Conduct group researches with the aim of improving members' knowledge about the subject in question. *Review and recommend related books. *Help its members in all possible ways. Welcome to The Online Physics Club! Say hello to our members, introduce yourselves and say anything you like - it's your first day at TOPC. Enjoy! Have doubts regarding the working of TOPC? Don't want to ask the moderators at the Queries to the moderators forum? Ask the other TOPC members, here! Applied and interdisciplinary Physics discussions here. Discuss astrophysics and astronomy here! Discussions regarding the Chaos theory, here. Discussions about classical mechanics, here. Discussions about condensed matter Physics, here. Discussions regarding dynamical systems here.Visit the Classical mechanics forum for discussing about Newton's laws of motion. All discussions regarding experimental Physics, here. Have you done an experiment? Share it with us! Discuss the fundamental interactions here! Discuss about the various literary masterpieces related to Physics. Let's build the Unified field theory! All serious Physics talk which lies between preset forums, here. All right, physicists! It's time to relax and casually chat . . . Physics! Talk everything - from theology to wallpaper changing! Go ahead!